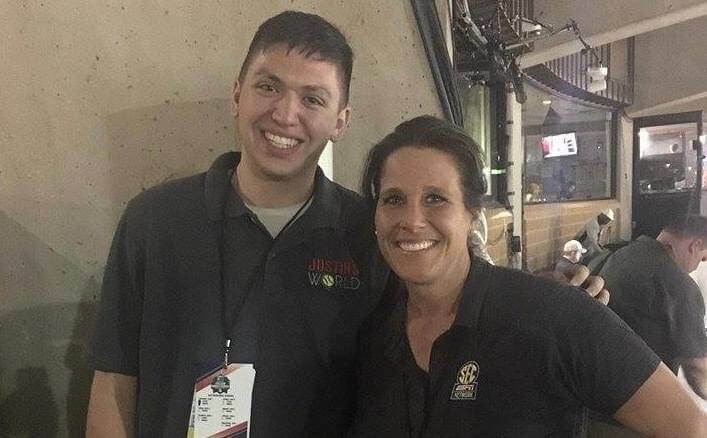 Justin McLeod with Jenny Dalton-Hill at the 2018 Women's College World Series. This is Brentt Eads of Extra Inning Softball… working in the media for a few decades, I’ve always respected writers, journalists, editors, bloggers, etc. who do things the right way. As with anything in life, it comes down to relationships of trust and the good ones do it right where they’d rather sit on a story that report something wrong or, worse, potentially harmful. 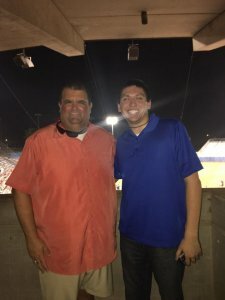 Over the last year, I’ve come to respect Justin McLeod who runs the website Justin’s World Of Softball. Many times, especially in this summer of college coaching changes and player transfers, Justin was right on top of it breaking story after story because he’s well-connected with the movers and shakers in the sport. I was born in Memphis, Tennessee and raised all over, as my father was a Minister. We lived in four different states: Tennessee, Arkansas, Alabama, and Louisiana, where I’ve been for the last 11 years. 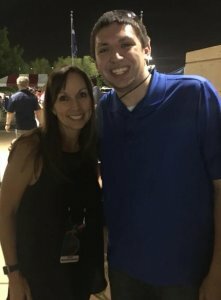 Justin McLeod (right) has made it a tradition that every year at the Women's College World Series he gets a photo taken with Leah O'Brien Amico. Here they both at the 2018 WCWS. You were saying earlier you’re based in a locale not exactly close to any softball hotbeds! Were you an athlete growing up? The extent of my athletic prowess occurred in the fifth grade when I played one year of church league baseball. I was the fourth outfielder and that told me all I needed to know about my athletic abilities! But about that time in my life, I learned that I really loved to write. My goal originally was to be a fiction writer; I’d create characters and write page-long descriptions of them, down to their hair color and what car they drove, and make a story around them. Looking at those stories then, I thought they were great; now I look at it and they’re pretty bad! Somewhere along the way, though, I found that I loved non-fiction (real stories) and I love writing about things that actually happen. Fast forward a few years, I was looking into internet and web-based sports writing; the passion was still there and I fell in love with it because it was non-scripted… you literally can’t make some of this stuff up. I decided that was something I really wanted to try out and see what I thought. When I made the decision to go into online sports reporting, what I loved about softball was that the stories were untapped, they were fast-paced, and there was always something going on. If I wrote a scripted ending, I wouldn’t have thought to have the third baseman (Jessie Warren of Florida State) make a diving catch and then double up the runner at first to all but close out the championship. How did you end up becoming so immersed in softball? I got into softball almost by chance. At one point in my career, I was doing some newspaper work covering high school basketball, football, baseball, track, and softball. I enjoyed it, but I wanted to get down to covering just one sport where I could concentrate on it. The deciding factor was that in baseball and football there was nothing I could add that someone wasn’t already saying. I’d be running in a circle, repeating what others had to say if I did those sports, but softball is fast-paced and there was something always interesting going on. At that time, it was 2012 and there wasn’t a whole lot out there in terms of coverage. Softball, I decided, was an untapped market for one of two reasons: either the market’s just not there or the market is there, and no one has discovered it yet. I decided I might as well give it a shot; it’s what I wanted to do. I knew softball as a sport and knew the cast of characters, but I didn’t have any connections. I always wanted to challenge myself, so I started covering the news. One of the first interviews that I did was with Alisa Goler (current Penn State coach, then in her playing days) and I felt that, if I, a newcomer in the collegiate sport, was going to do ‘legitimate media’, I’d have to do some of these types of interviews. I had a set list of questions that I asked--very basic stuff--just to see how it went, because I was still in the mode to see if it would work or not. Their answers were well-thought out, and I soon found out that players and coaches were giving me great answers, good interviews, and the stories got really good web traffic. From the earlier two possibilities, I saw that it was indeed an untapped market. What is your approach or focus when it comes to coverage… is there an area you tend to focus on more? I started the softball site in 2012, what I call “softball lite” as it wasn’t every day content. Once I realized the market was there, I committed to it and the site kept getting bigger. When it got as big as it did as fast as it did, I knew there would have to be a certain line I’d have to draw--I couldn’t cover every single thing every single day. So I put it down where I said in a loose definition, ‘What do I want to cover?’ I knew college was the first priority, USA Softball was obvious and I knew if there was a big story somewhere, I would cover it. My approach and philosophy is that we don’t write anything simply to please people or we don’t write anything simply to offend people. I’ve told myself that if I write something to fit one of those approaches, then that’s the day I don’t call myself a journalist. I’ve gotten criticism and I’ve gotten praise, but I don’t do the work to get one or the other; I do it because it’s the truth and it’s accurate. It’s about doing something the right way and sticking to it. And I’ve found that it doesn’t go unnoticed, and what I love about softball is that as big as the sport gets, it’s still like a family. It’s how people in the game act. The more I was in it and around it, I saw that. I’m from the South and still just a good ole’ boy and that’s similar to my personality. When you break a story, how does it typically go for you, from first hearing about something to confirming and going with it? Whenever I hear a rumor, tip or something, I’ll work to confirm it. In today’s world of breaking stories, people can say something is not a story because it hasn’t come out and been issued by the team or individual, but if I know that it’s right and legitimate because I’ve checked the facts, I will run the story because I know that it’s accurate. I want my readers to know that they can have confidence and can trust that it’s accurate, too. Over time, I’ve found that some of my tips come from people who have seen what we do and respect the way we approach and do it. Alex died from ovarian cancer on June 25, 2018. What’s been your favorite story to cover in your six years in the sport? That’s a tough one. The first one that came to mind was the Alex Wilcox story. I had covered Mississippi State in a weekend series during the season, and was around the people close to the team. I remember when they were doing the opening line-ups for one of the games and the PA announcer (also one of the school’s associate athletic directors) was asked about Alex Wilcox, who wasn’t physically with the team, but they said they would leave her in as part of the line-up because she was a part of them. That stuck with me; it caught my ear at the time, and I’ve always remembered the tribute and love they felt towards her. 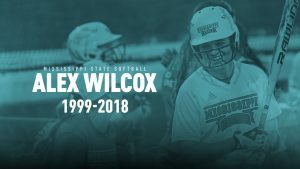 When Alex passed away, I saw the news early and intentionally made the article short and sweet, without adding any commentary because I knew what she meant to the softball world. That obituary article is one of my most-read articles ever, and I remember reading the comments and social media posts that went on for days as people were adding their memories of her and how much she meant to them, and these weren’t just MSU fans, either. You’re talking about an 18-year old kid, and it was powerful, the message of all that she meant to them. What do you like about the direction softball is headed and what concerns you most? I like that softball is growing and doing so primarily without losing itself. It’s easy for a sport to get bigger and for people to get a big head and for people to be looking simply to capitalize and make money off of it. But then, for instance, you see someone like Lonni Alameda at Florida State, who, after winning the Women’s College World Series, is still just Lonni Alameda and being herself in the weeks and months after the championship. That’s just one example, but there are many like her who stay true to themselves. There are many who love the game, who want to be part of that growth and not counteract it, and I love seeing that. It’s obvious they’re doing it for the right reasons. As far as what I don’t like, you often hear people talk about a rule they like or don’t like. I think that softball is relying too much on strictly the rule book. Take something on the field, for example, like obstruction. If you have the true definition of it, the umpires know that definition and are well-versed in it, then why do we have to go into the details of the rule and micromanaging into the fine print? That’s one problem I have, where people are looking into every nook and cranny to get an edge and there are those looking to bring an edge in with them to get an advantage. I think we’re relying a little too much on micro-managing and not enough on the game being the game. When you take away from the game being the game, it will do more harm than good. Looking back over 2018, what’s been a top story or two that you think was most interesting, newsworthy or important? I enjoyed the World Series run for Florida State that surprised a lot of people (I’m going to note here that, while I changed my prediction in OKC, I picked the Noles preseason! ), but I think the off-season as a whole was the No. 1 story. Last year, we had the Michael Lotief story at Louisiana-Lafayette, the Auburn coaching change, and all that, but I never thought this year would beat that! Then Texas made a coaching change, we ended up having 59 head coaching changes, almost 200 assistant moves, and about 115 player transfers at the D1 level alone. That would probably be my No. 1 storyline because it was so expansive and then it kept going on with retirements, hirings and firings and more—and it was also about how impactful so many of those moves were. You had four All-Americans transfer this off-season--I’ve never seen that--but you also had ones like the Shannon Rhodes’, the Danielle Gibsons, and others who meant a lot to their previous teams, and their additions now mean a lot to their new teams. On the coaching front, just the thought that the No. 1 seeded coach in Mike White of Oregon would leave means so much and has so many ramifications. I think the story is that we have had so many of them this year!